The Avenue Collection on the Hudson River in Weehawken, NJ is this month's featrued community. The Avenue Collection is the newest offering along the Gold Coast. This magnificent 7 story tall glass complex directly adjacent to the Weehawken Ferry. Spectacular and sensational are adjectives that do not say enough to describe this magnificent complex, built right along the Hudson River Riverwalk. If views are essential, if luxury at the highest level is a priority; then this is the place to call home. It sits steps away from the banks of The Hudson, surrounded by a beautiful, bricked public walkway. It is pet friendly. Luxuryretail will be part of the addition to the community with restaurants, shopping, activities and just taking in one of the most spectacular skyline views anywhere in the world. The community is in its first stage of development. Built by Lennar Urban, The Avenue has 74 homes of concrete & steel with all glass exteriors and accents of brick and metal panels. This is the first of 5 buildings totalling more than 600 homes to be built over the next 4 years on the land just south of the Port Imperial Ferry. and accross from the Bergen Hudson Light Rail. 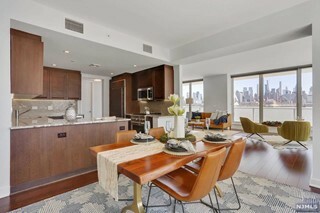 With retail on the ground level and its spectacular views of the NYC from the George Washington Bridge all the way to the Verranzano Bridge, it is truly a sight to behold. 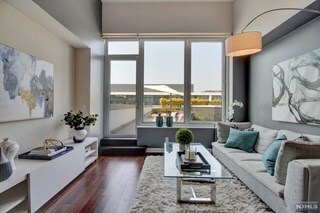 The interior finishes are stunning. The open kitchens include GE Monogram appliance suites each with a Pro Style Range, undercounter wine cooler, stainless steel refrigerator and dishwasher; Spazzi European cabinetry, DalTile Marble floors and backsplash and granite counters. Each residence boasts Brazilian Chestnut hardwood flooring, and custom baths with all glass showers, and custom stone finishes throughout. Most bedrooms are carpeted. Stackable washer/dryer combinations are included. Each residence has its own private outdoor space. Townhouses have outdoor patios and some have exterior entrance doors in addition to the doors from the hallways. Other residences have terraces. The Avenue Collection also contains fully appointed guest suites to be reserved/rented by owners for their company as well as private storage and bike storage rooms. The Avenue Collection amenities are top notch and include an enclosed parking garage with 2 spaces for some residences, a Grand Salon/Lobby lounge with fireplace; 24-hour doorman and concierge services, an Integrated Building Security System with controlled access; conference center, 2 fully appointed guests suites; a social room with direct NYC views; and multiple gathering areas including a lounge and catering kitchen. The fitness center includes sauna and steam showers, workout room with high-end equipment and a yoga/pilates room. Outdoor areas include open lawns and plantings, seating areas with a fire pit, sundeck, and cooling spray area. Just next to the complex where Arthur's Landing used to be resides Molos, an upscale Greek Gourmet Restaurant that has opened to rave reviews. A short ride down River Road are the shops at the Lincoln Harbor Mall that include Ruth's Chris Steak House, Houlhan's Restaurant , and the world famous Chart House. Additional shopping malls, markets, private schools and more restaurants are just a few short miles north in Edgewater.